This stuff is still out there... picked up this helmet today. It's complete with it's liner and chinstrap. There is a number written on the chinstrap at the top of the helmet but I can only make out 407 as the last three digits. Do you think it could be part of a regimental number? 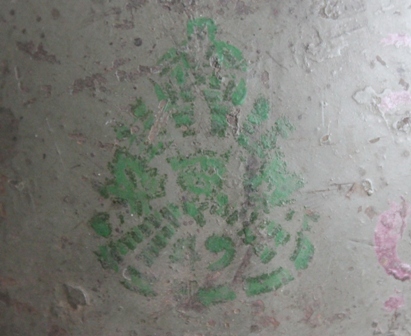 Has a nice clear painted cap badge with a second very faded cap badge on the opposite side which I believe is unusual. Nice! I have yet to find a nice WWI helmet that is complete. I can only find rusty old shells. nice find! whats the story behind painting these helmets grey? I was told this was done post ww1? still a nice helmet I would add to my collection ! mk1rceme wrote: Nice! I have yet to find a nice WWI helmet that is complete. I can only find rusty old shells. keep an eye out on ww1 helmets from the US on ebay, I saw a near mint one (british made) go for just over $100 and one in worse condition go for over $400 from the UK ! Jonhno wrote: nice find! whats the story behind painting these helmets grey? I was told this was done post ww1? still a nice helmet I would add to my collection ! 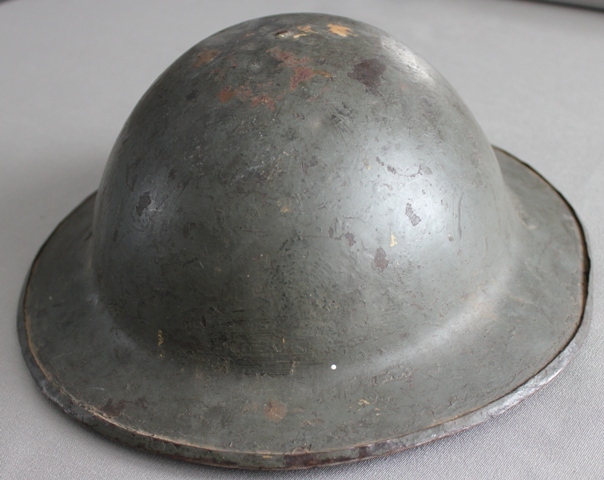 According to "Tin Lids" by Roger Lucy: "As with their British counterparts, many early Canadian helmets were painted a blue-grey or dark green colour over their khaki factory finish." 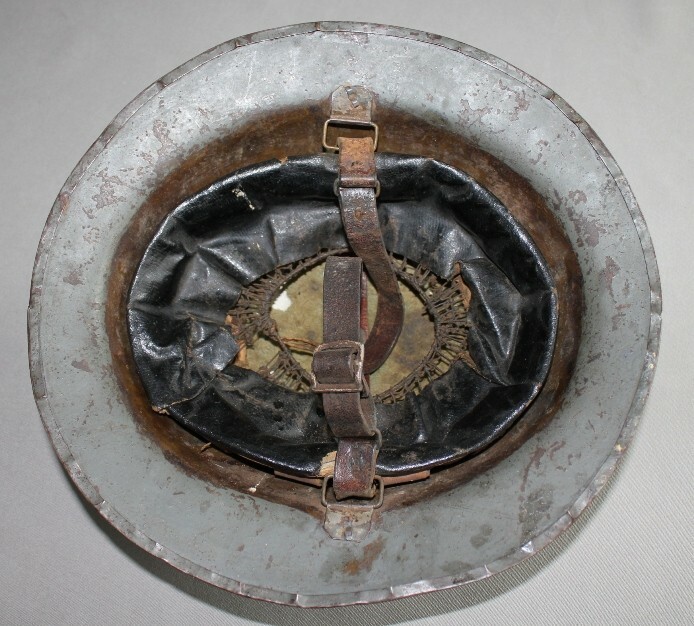 This helmet appears to date from around 1916 as it has the reinforced rim but no rubber ring in the crown of the liner. IIRC, the 3rd Division ordered their battalions to paint their helmets grey at the end of the war. Steve, are there any markings on the helmet? So there were two time periods in which this helmet could have been painted. How would I determine which applies to this helmet? By the shade of grey used? Bill, I've already mentioned the only markings I can see other than the stamp inside the lining which I didn't bother to share. The helmet is likely a "coming home" helmet. Somewhere there was information about painting the helmets of 3 Div, which I can't find off hand. Many of the division's units also added the battalion badge. Examples of grey 2 CMR, 52nd Bn, 58th Bn, CE helmets with painted badges have been recorded, and examples of grey helmets with actual badges affixed have been reported for the PPCLI, RCR, and 4 CMR. Sorry Steve, I didn't understand that there were no markings on the shell. I thought your comments only referred to the chin strap. That helmet is a beaut! Bill, I certainly wasn't clear in my post but the shell markings are not visible. They must be buried under the paint. I am curious though why this would have been pertinent information. Curiousity. Lucy notes some markings can be found on the shells. Maker marks, and lot numbers. 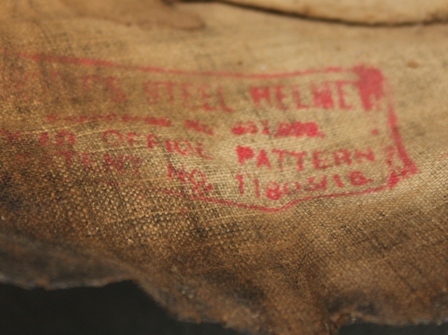 If the steel shell is marked "Patent Applied For", it can be dated pre August 1916. And if it has certain alpha character markings it may be a US made shell. I think there may be a bit of a misunderstanding.... the "Patent applied for" mark is not stamped into the steel but is an ink stamp on the liner material. My helmet has the later version of the stamp with the patent number as seen below. Also, my helmet is not an American made example as it has the split rivets holding the chinstrap bales. Thanks Steve, my mistake re the patent mark. There are no maker marks or batch numbers visible then? No, nothing. I'm sure there is something there but I just can't see it. Thanks Clive, that about clears up this issue. So it's definitely a helmet from the end of the war. Went to the Loyal Edmonton Regiment museum today and with the help of two of the staff we were able to decipher the regimental number written on the chinstrap. Turns out the owner of the helmet was an American born man who enlisted with the 128th Bn as a reinforcement in Dec 1916 and was transferred to the 49th Bn upon arrival in England. He was wounded once in 1917 and sentenced to 21 days field punishment no. 1 for being AWOL from a morning parade in Feb 1919. Nice to be able to attribute an item like this to a particular individual. Great to put the human story to the artefact. Well done. Any information on , what the 1st div and 2nd div helmet were painted? This is a really nice helmet. This is a later war item as Bill has noted. Earlier 3rd div helmets have battle patches painted to the left and right sides and are the standard green brown colour seen on most helmets. The later war versions are painted grey and have the badge colour painted to match the brigade colour of their tunic battle patches ... green- first brigade in the division, red- second brigade in the division, and blue- third brigade in the division. and 2nd div guys painted their helmets as well for the victory parade and what colour? I am trying distinguish war painted helmets and victory parade helmets. Bill wrote: Curiousity. Lucy notes some markings can be found on the shells. Maker marks, and lot numbers. If the steel shell is marked "Patent Applied For", it can be dated pre August 1916. And if it has certain alpha character markings it may be a US made shell. there are also some British helmets re-lined by the US, so a check under the liner for a black patent mark will tell you if it is or not. With respect to 1st Division, a circular from the GOC of 23 November, 1918 instructed Battalion COs to have their unit’s helmets painted as soon as possible ”...with the old Red Patch and the Regimental crest in any combination preferred by battalions, as it is the most uniform and striking head-dress we have". 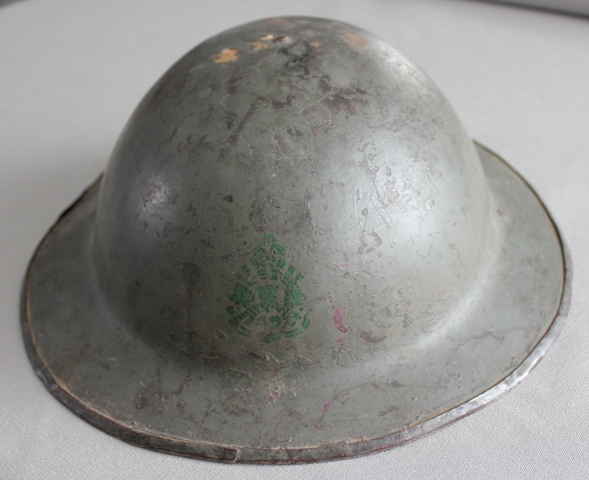 servicepub wrote: This is a good example of a 3 Div helmet on or about 18 Nov 1918, in accordance with Divisional Orders. Roger, in writing the early editions, didn't have access to a document I located at Archives. If and when I publish a third edition this story will be fully told. In accord with Division orders of 18 November 1918, helmets belonging to units of the 3rd Division were to be sent to the central depot and painted grey. The unit badges were to be stenciled at the front Painted badges were in red for most arms and services and for the 8th Brigade, green for 7th Brigade and blue for 9th Brigade. The badges of 3rd MG Battalion and the divisional veterinary company were in maroon, and the Division’s Signals, Motor Transport and Train in white. The Division’s staff had light blue badges. Most examples I have seen use a stencil of the cap badge, but I have seen several 4 CMR helmets where the actual cap-badge has been applied, while 58 Battalion (and maybe others?) stenciled its cap badge (in blue as per orders) on front side and its formation patch on the rear. I have not seen any regulations pertaining to the other divisions.